The shock of first bringing the fish out of the water. Michael and I are in a routine now. Down to the water, get the worm on the line, hook the fishing line to the chair I am sitting in, rather than leaving the pole on my lap, and then the charm of waiting for a fish. Getting the worm on the hook wasn’t much more pleasant today, although now I know I can do it. I have done worse jobs, so I think of those and just get the bait on the line and give it to him to throw in. He bobs it in and out of the water a number of times, checking to see if his lure is still working. It is. Now the dirt has been washed off of the fish and for some reason I think I should apologize to it. As I was sitting there I am also remembering the pleasant fishing trips I have taken in the past: my dad, Steve Carter, and Art Treleaven. The point for me is never to catch a fish, though the person who has a boat and a licence may feel differently. "I can tell if he is dead yet." 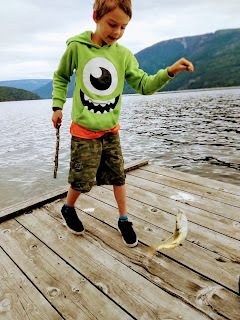 I had that relaxed feeling of a passenger on a fishing journey, as I sat on the dock, a person with no rod and no licence, and a little boy by her side. 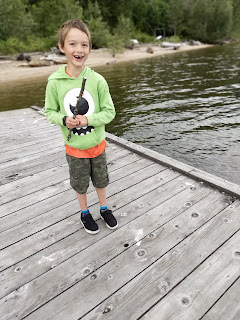 I enjoyed watching Michael walk all the way around the dock’s edge, one foot over the other, teetering at some points, then regaining his balance and one foot over the other again. For a while he sang Christmas carols. I listened to a rendition of Deck the Halls. When he was through he asked if I knew any other songs. I began to think of campfire songs that I could teach him while we were sitting there. A rendition of 99 Bottles of Beer on the wall would take him a long time to sing, but why not wait for a real campfire to learn that song. Better to do that song when a teen-ager. "Now, what do we do?" Suddenly I feel that pull of the line across my lap again. I call out his name. He has been hanging onto to the ladder on the dock. 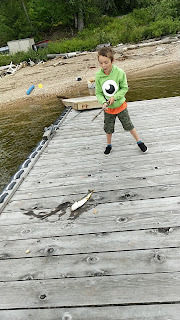 He leaps around me and grabs the line pulling it hand over hand until we both see a fish swinging on the end of the line. He turns and grins at me. I grab my camera and begin shooting pictures. I have been wanting to take lessons with my new camera, but never had the time. Each time I press a button nothing seems to happen. In the meantime he and I are exchanging information. 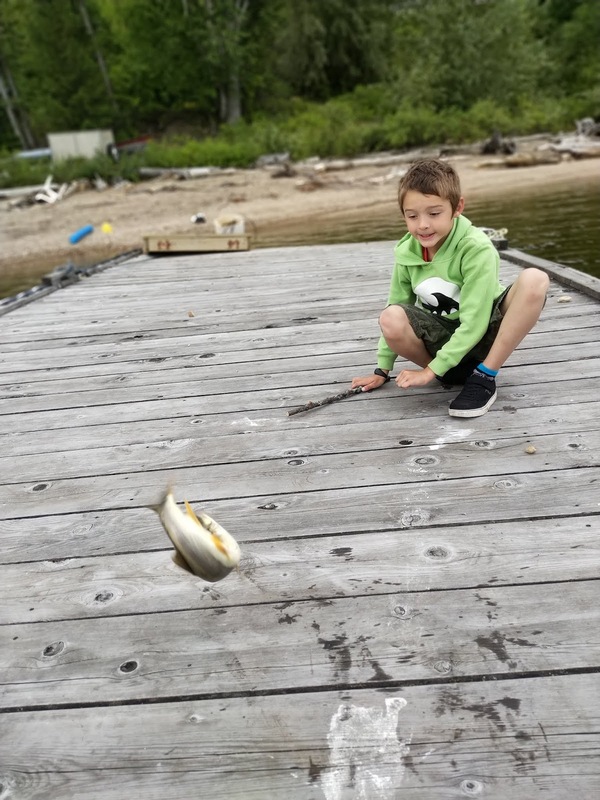 He picks up a rock on the dock which is only half the size of his tiny fist. Most of his throws don’t even come close to hitting the fish. 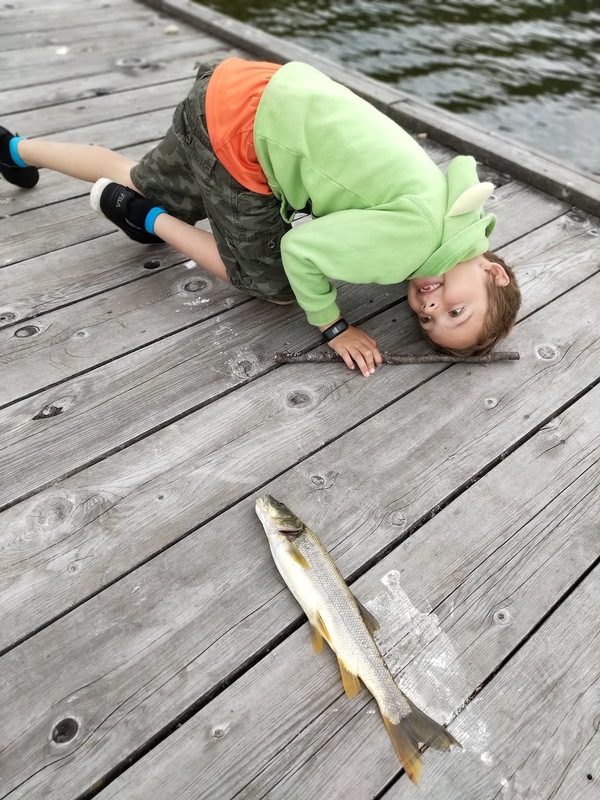 He decided to put it back in the water so it can have a little “air”. I tell him not to put it back in the water, but before I can finish my sentence it is already in the water. Then he brings it back out. I am amazed for it is still on the hook. 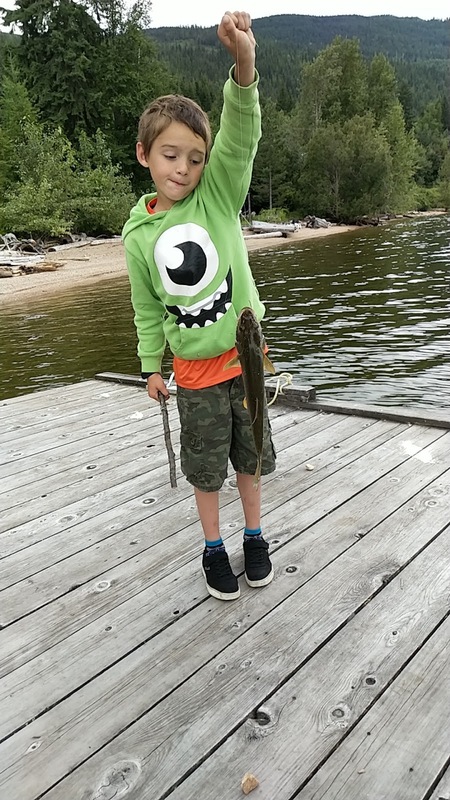 I can see that what we have caught is a Northern Pike Minow, not to be confused with a Northern Pike which is quite a nice fish. 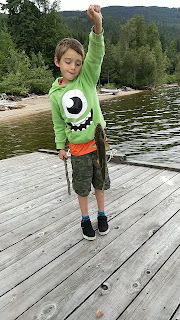 This one is a bottom feeder – not a good one for the frying pan. We walk back up to the house so we can tell others about our adventure. As we cross the tracks, one of the railroad workers calls out to us, I think, but I cannot be sure anymore when someone calls out, to whom they are calling. But it is the truck driver from yesterday. I can tell from his Scottish brogue. He runs after us and catches up to us on the other side of the tracks. I cannot remember the politically correct name for that fish at that moment, so I just tell him I don’t know the name of the fish. I asked him how he knew we caught a fish. “Well, I could hear you yelling,” he said. and his fish in the other. I am glad the ordeal is over and that I have caught a few camera shots for proof of our adventure. What I do not know is that I have hit the record button when I tried to take that first picture, so our adventure on the dock is both visual and aural. Bonnie Wyora and I listened to it and watched it last night. Bonnie is good at picking up on the sounds of Michael's little voice, and she knows exactly what Michael was saying and what I was saying. I have sanitized the events as I heard them on the tape, for the purposes of blogging it. As we went to sleep, Bonnie said, I haven’t laughed that hard in 2018. 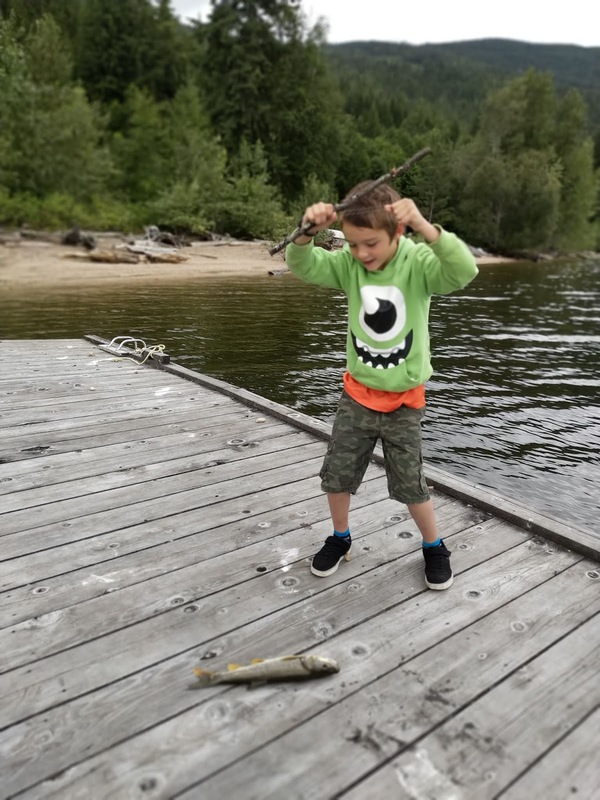 Later that day, Miranda went to Salmon Arm and bought a fishing licence. A little boy from Alberta can’t fish unless he is with an adult who has a licence. Further to that, she read the fine print of the licence. Apparently there is to be no live bait. They went fishing this morning with a licence and the correct lure. i want to hear the full video/audio feed! You can find the video, which I took by accident. Thought I was taking a picture. Then kept pressing buttons, none of which seemed to work, but I was in a moment of sudden shock. The video is up on Richard's Goggle Pictures. Help yourself. 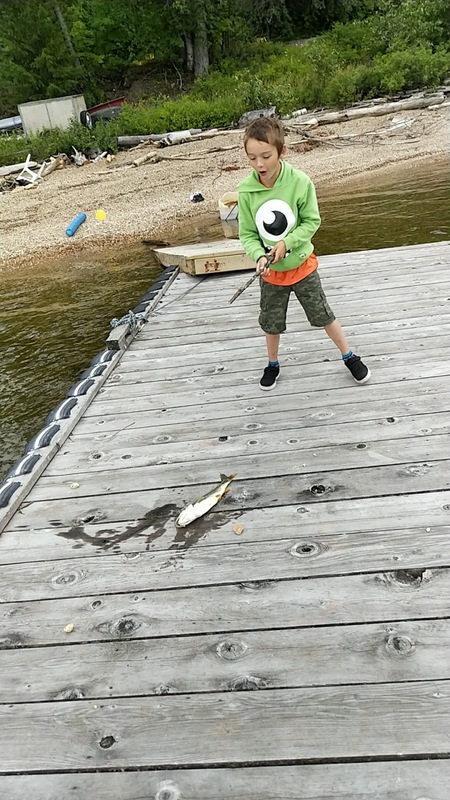 Do not be surprised to hear me telling him that the fish is human. I have been thinking about the indigenous myth of the creation of the world about Xhels (bad spelling). You know where the world is all humans and then he takes some and makes them animals, birds, plants, mountains, rivers, etc. So while I was with you I kept trying to think of the world in this way, instead of my traditional way. Thus, taking only what I need, etc. Anyway, all of that came flooding back to me. Now I think his laughter was nervous laughter. Mine surely was. Oh, what a day. You will have to watch 7 minutes of my camera going all over the place. A rocky video. Miranda went to Canadian Tire and bought fishing rods there for them. They are out practising throwing their lines with only weights. No bait. On the front lawn. I am now laying down and hope that my dreams don't feed me that video.